You’ve likely seen my first couple of posts on the Wine Bloggers Conference held in the Finger Lakes last month. But you probably don’t know how essential palate cleansers are to the wine tasting drill! 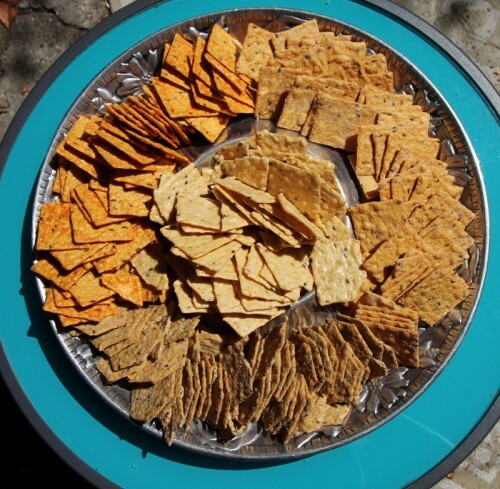 When you are sampling upwards of twenty wines a day—and likely many, many more—having something that can break up the relentless onslaught of tannins is a taste bud savior, and for WBC15, Crunchmaster Crackers served that role. I first came across these multigrain, low-calorie crackers at the Expo on the first afternoon of the conference. Mary Jo Garinger, PR contact, manned their demo table, and in addition to being a lovely person who seemed genuinely proud of Crunchmaster’s snacks, she offered to send me samples to review after the conference. 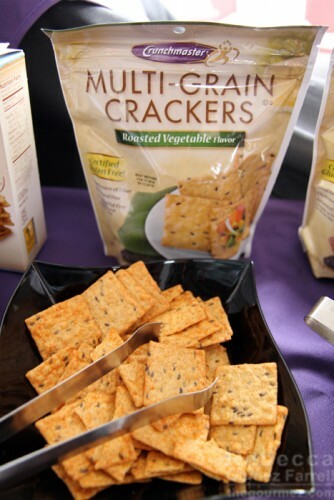 I thought the roasted vegetable multi-grain crackers lively and fun at her table, and I said sure. Little did I know these crackers would make appearances at many of our sessions throughout the conference! 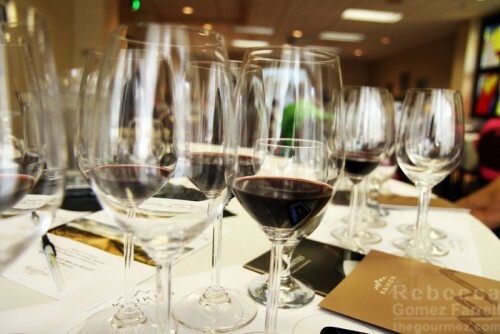 By Saturday’s Wines Across the Andes session, I was thanking the stars for the little packets of crackers on the tables, nearly hidden by all the wines waiting to be tasted. 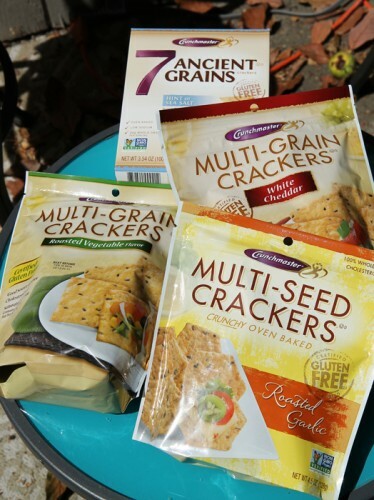 Mary Jo sent my samples swiftly after the conference, and I was delighted to see such a nice selection from among their large product line, all of which are gluten-free, 100% whole grain, trans-fat-free, and come in at 10 calories per cracker or less. Obligatory disclaimer: Samples means these crackers were provided for me free of charge for review. I decided to begin with the 7 Ancient Grains to act as a standard that I could judge the other crackers by, being as it was the only unflavored option amongst my choices. It’s made with brown rice, sorghum, quinoa, sesame, millet, flax, and amaranth. In addition to the grains, potato starch, safflower oil, and salt make appearances on the ingredient list. 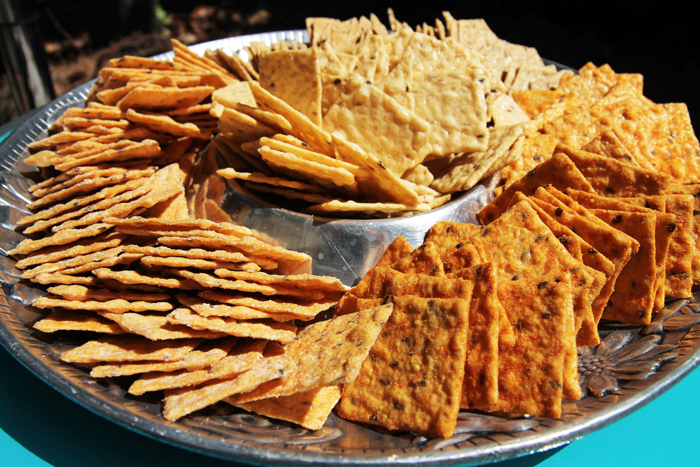 All in all, a healthful grouping for crackers! The 7 Ancient Grains are in the middle. Up close, the flax seeds, sesame seeds, and quinoa morsels were easy to see. The crackers provided a great crunch and had just enough salt to please me—which, fair warning, means it may not be enough for most palates. It would work great as a delivery system for strong-flavored toppings such as smoked salmon and lox. 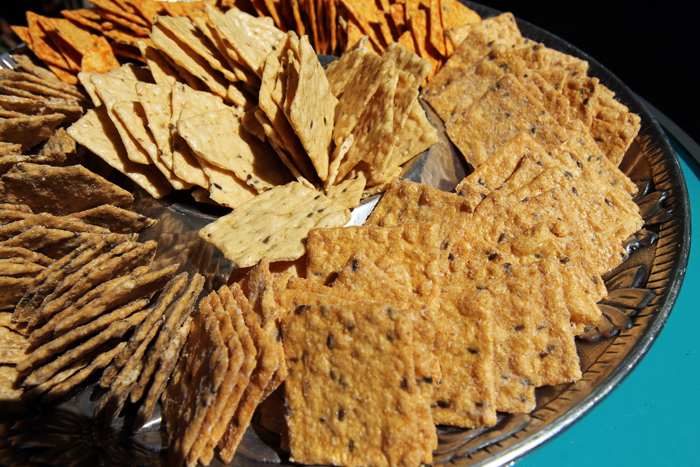 The multi-grain crackers were flavored by powders, though the exact make-up of the crackers differed. They were all grainier in texture than the 7 Ancient Grains, and two out of three added yellow corn to the ingredient list. White Cheddar on the left, Roasted Vegetable on the right. White Cheddar: There was a lot more going on here than white cheddar, which was obvious from first bite! Sour cream, onion, annatto, and dried cane syrup for sweetness all joined the ingredient list, and you can taste them, for sure. Cheddar came first, but it was quickly overwhelmed by the sour cream tang. The crackers are tasty, but I want more cheese. Sour cream and onion would be the more fitting moniker. Roasted Vegetable: Tomato and green bell pepper stood out among the flavors dusting this cracker, as did its attractive red-orange coloring. These are crackers worth taking notice of, and you want that flavor to shine through, so serve them with something cooling like cucumbers and yogurt. Dill too, if you’re feeling fancy. Roasted Garlic: No need to try and taste the roasted part of these crackers—it’ll announce its presence loud and clear! Sesame seeds take a more prominent role in the ingredient list, and I think that’s part of why the roasted quality is so dominant. The powder is light, as is the garlic flavor, which is a good thing. Who wants to overwhelm a party crowd with garlic concentrate? Come for the roasted dynamic, stay for the pleasing flavor combination with white cheeses, both hard and creamy. I keep meaning to follow up with Mary Jo because I was a huge fan of the Crunchmaster crackers I tasted in the Finger Lakes. It looks like you really had a nice variety to sample. I’ve since noticed them in both our local Harris Teeter and Costco, which makes finding them pretty easy.